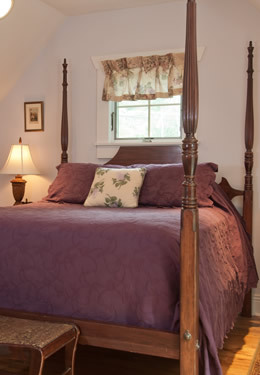 Our most requested suite, Violet is located on the 2nd floor of the Carriage House. 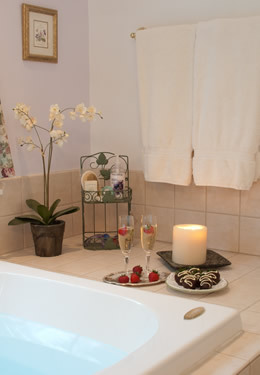 This suite is ideal for those seeking a romantic getaway and enjoying our two-person Jacuzzi. Decorated in lavender and purple, this suite features a private French door entrance, a queen four poster bed, stone gas fireplace, a large bathroom with a two-person Jacuzzi tub plus a shower. Quilted robes are provided for your comfort and relaxation. Also a mini-refrigerator, microwave and coffee maker are present. Wine glasses and bottle opener are provided so you only have to bring the wine. Guests have frequently referred to this as the Bridal Suite.